Lonette Berg (standing, center), executive director of the Alabama Baptist Historical Commission, shares about the work of the commission during the Wednesday morning session of the Alabama Baptist State Convention annual meeting Nov. 18. 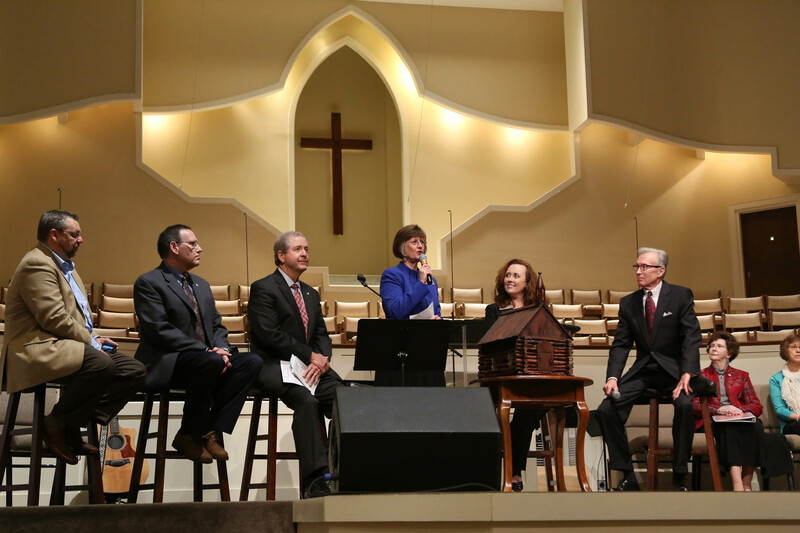 DAPHNE, Alabama (TAB) — The second and final day of the Alabama Baptist State Convention (ABSC) annual meeting heard prayer requests from entity leaders and ministry leaders throughout the state. Buddy Champion, pastor of First Baptist Church, Trussville, shared from Matthew 7:7 during the convention sermon. Officers were re-elected without any discussion — Travis Coleman (ABSC president); John Thweatt (first vice president); and Tim Cox (second vice president). Look for a full coverage of the annual meeting in the Nov. 26 issue. This entry was posted in Home and tagged Alabama Baptist Historical Commission, Alabama Baptist State Convention, annual meeting. Bookmark the permalink.